This deluxe Special Author’s Edition, begins a new life, guiding a new generation of firehouse cooks through the kitchens of North America. With attention to detail, Islandog Publications has restored many features and original information. Included are “the lost pictures”; and Firefighter Mike is returned to the cover. Many of the full color photographs, spotlight spectacular fires from Nova Scotia to Los Angeles and Edmonton to Miami. This special hard cover edition, is bound and printed using the highest quality materials and finest craftsmanship. Written by an accomplished cookbook author, and enthusiastic firefighter sponsor. 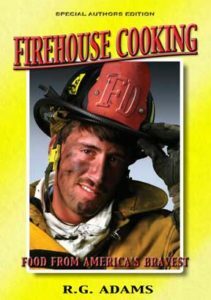 Firefighters throughout the United States and Canada helped by contributing to the over 200 recipes included. Firehouse Cooking, ranges from Appetizers to Beverages, and also includes Soup, Salad, Quickbread, Main Course, Side Dish, and Dessert chapters. Each recipe lists ingredients in order of usage, with easy to follow instructions, and clear terminology, making them a pleasure to use again and again. These recipes will satisfy any picky appetite, add a bit of variety to old standbys, and enjoy raves at the next potluck barbecue. Use this very special cookbook everyday. To any cook, career or volunteer, it will become an important resource tool, and an epicurean journey through the firehouse kitchens of North America. To thank you, our favorite sponsors make available an extra special coupon to every firefighter supporter who buys a copy of this cookbook.